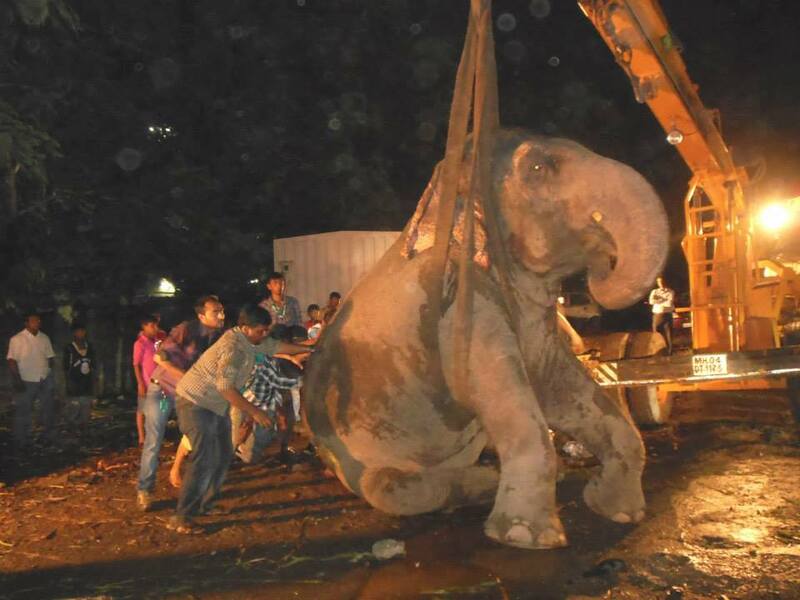 Mumbai -Bijlee the elephant has been working continuously for 51 years. She’s never stopped until now. 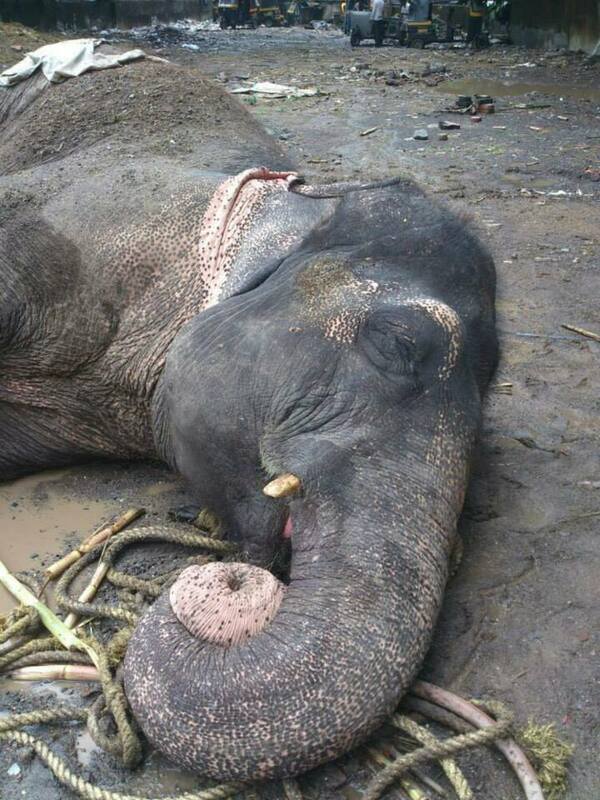 She collapsed; with maggot infested wounds on her legs, in pain and fatigued, and lies where she fell. The owner of Bijlee, and other elephants, has subjected them to abuse and neglect, forcing them to beg, entertain, and walk for his paycheck. She has been overworked and uncared for all her life. The group Animals Matter to Me, has taken steps to help this injured elephant. 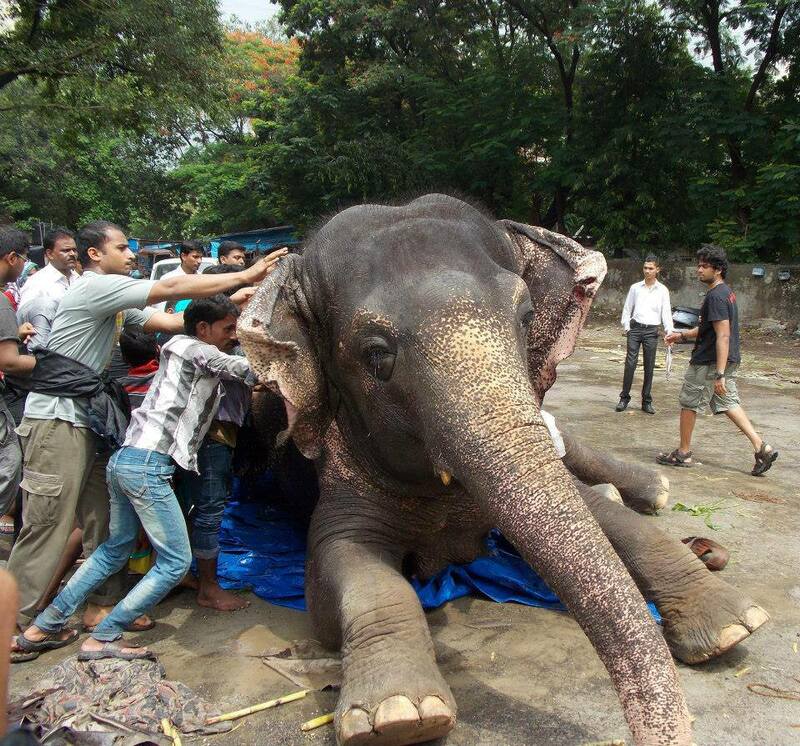 They’ve used a crane to lift her when she falls, have brought food for her, and started treating her wounds. The first couple days, they had help from neighboring people; however the majority have left her now. 1. A vet with knowledge of treating injured elephants. From any part of the country. A contact number, a lead or any information would help. 2. Someone who can help transport Bijlee to the Animal Hospital in Parel. A crane has been coming in every day. But she’s too weak to stand, and the ropes are not being able to hold her up. A specialized crew who has some idea of transporting large animals would help. Again, any information, any leads would help. 3. Volunteers. Today there were 5 people there. And they need help, to run around, to put pressure on the system, to mobilize support, to organize food, to find vets…you get the drift. Please come. If we have 50,000 people there, we can create a noise and put pressure on the system. Hopefully, some politician or even the state government will come forward. 4. Donate: Generously. Bijlee needs food and medicines. Every little bit you can contribute will help save this magnificent creature. And I believe you get a tax exemption. Even more reason to donate. It’s raining. They are trying to build a shed. In the meantime she’s covered with black tarpaulin, so her wounds don’t get worse. If she dies, shame on every one of us. If we can’t save one elephant, how will we save our city, our forests, our rivers, our mountains. Landmark – Ganpati Mandir Lane. Thank you for the re-blog Laura! She needs all the help she can get. Love and light and bless your souls dear friend !! I am angry that the government even allows this man to keep animals if he’s going to abuse and neglect them in this manner. He should be in jail and the elephants should be relocated. This is criminal and very upsetting. It is illegal, however not particularly well enforced unfortunately. And yes, it IS upsetting. Thanks for the re-blog-she needs all the help we can give her. I don’t understand how to transfer money. I have a PayPal account, a debit card, and a checking account at a credit union (with bill pay service). Will someone explain how to do it, please? Thank you! International donations can be a bit tricky. I would call one of the numbers on the bottom. If someone has a better answer or more info, please let me know so I can spread the word. I read nothing that once her life is saved, it would be better. Does she go back to this wonderful man? In some cases, it is best to return a suffering animal back to God’s loving embrace. I see a girl very tired of this life. Stop her suffering and allow no more abuse of her ever. Allow and help her to back to paradise. Will she recover only to suffer longer at the hands of those who are clueless?